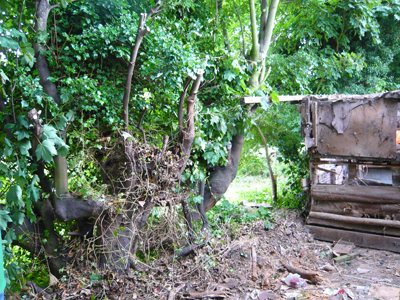 tearing down the sheds has revealed a lovely view to the north of my garden. 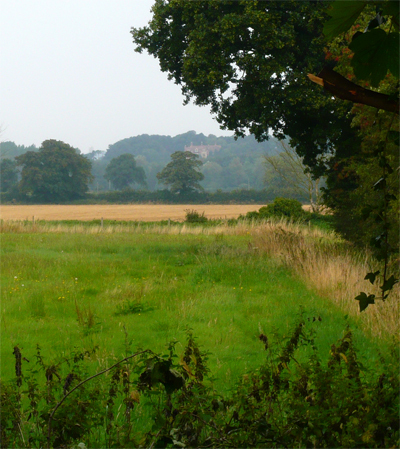 you can see Field Dalling Hall there amongst the trees in the distance, and if it had been clearer today you could have seen the top of the church tower as well. however, the rebuilt sheds will block this out, as well as winds from the north and north west. I will have a couple of windows, but we are planting a hedge along the boundary, so unless I am allowed to cut a window in the hedge too, I will lose the view eventually. 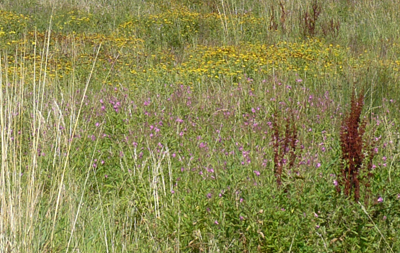 the co-owner of the boundary lives in a house which overlooks this meadow and he needs the trees we are removing to be replaced by some sort of landscaping. 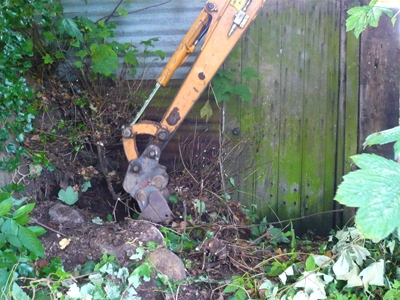 Peter and Alan hired a mini-digger on Friday and cleaned up the ground behind the sheds. I have a group of pots sitting outside in the sun and breeze (August’s last day is very warm and humid) to dry for a biscuit firing. they are all made with the pale clay and most have porcelain overlay. 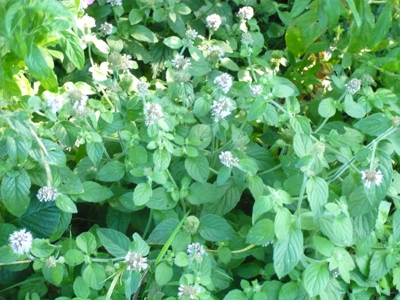 humidity has been high all week although we have not had any rain, and the pots have been drying unexpectedly slowly. the combed lines on these pots are beginning to remind me of the decoration on old African pots or carvings. I suppose this should be no surprise since I recently bought “For Hearth and Altar”� a beautiful book on African Ceramics from the Keith Achepohl Collection by Kathleen Bickford. the shapes are vaguely totem-like as well. I hope to have a biscuit firing and then a glaze firing this week, before the new pitched and tiled roof goes on the sheds. 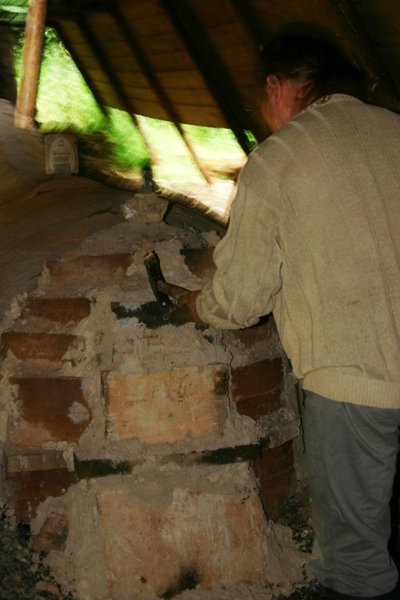 I am keeping my double corrugated tin roof, with its sandwich of rock wool insulation, over the kiln; but there will be a stainless steel duct wrapped in ceramic fibre to take the heat from the chimney to the gable end rather than through the roof, and I may not get this for a little while. while the harvest is in, due to the dry week we have just had, (although many farmers cut the wheat very damp and have had to spend a fortune drying it; it wasn’t dry enough until four or five in the afternoon most days) I am hoping for more dry for the shed building. tomorrow two of the five sycamore trees will be cut down, and from Tuesday things should be progressing with some speed. there is the concrete floor to lay, with the rest of the posts in, and then the framework should go up. 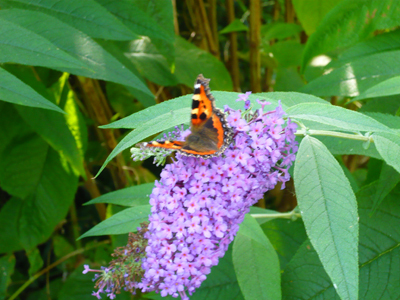 today we are forecast thunderstorms later, but meanwhile the butterflies are busy on the buddhlias. there are a good few small tortoiseshells. 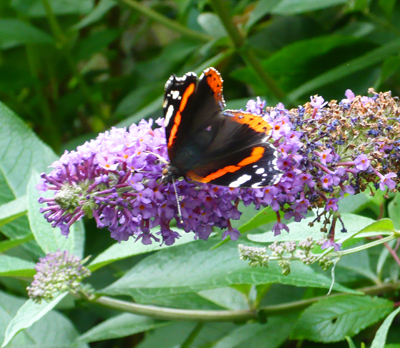 this is the first time I have seen them this summer, but they are supposed to be a very common garden butterfly. my garden is full of goldfinches too, chattering and whistling away in a delightful fashion in the sycamore trees. I can hear them in the pot workshop. a found photo of a male goldfinch. I have had to stop feeding the birds as the greenfinches and chaffinches had begun to die from a parasitical infection called trichomoniasis which lives in the upper digestive tract of the bird, and its actions progressively block the bird�s throat making it unable to swallow food, thus killing it by starvation. “birds with the disease show signs of general illness, for example lethargy and fluffed-up plumage, but affected birds may also drool saliva, regurgitate food, have difficulty in swallowing or show laboured breathing. finches are frequently seen to have matted wet plumage around the face and beak. in some cases, swelling of the neck may be visible. 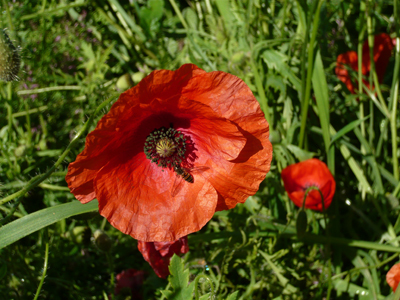 the parasite is vulnerable to drying out and cannot survive for long periods outside the host. transmission of infection between birds happens when they feed one another with regurgitated food during the breeding season and through food or drinking water contaminated with recently regurgitated saliva, or possibly from droppings of an infected bird. good hygiene practice, specifically the regular cleaning of all feeders, bird baths and feeding surfaces, is an essential part of looking after garden birds and will help to lower the risk to birds of diseases, including trichomoniasis. I have taken down the feeder and used Milton steriliser on it. I wonder if the wet weather we have had through August has made transmission of the parasite easier. 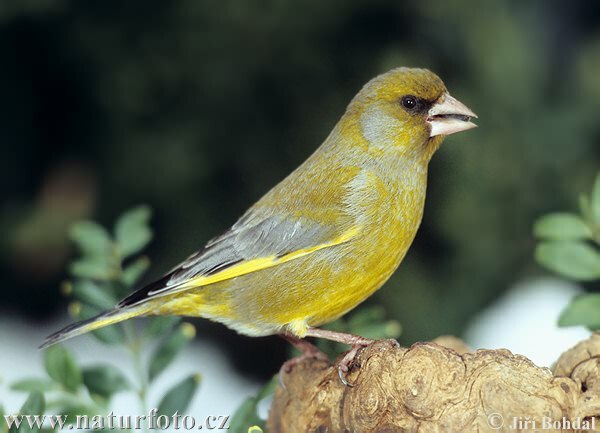 this is a found picture of a male greenfinch. the week I had been dreading arrived, but it turned out a lot better than I expected. 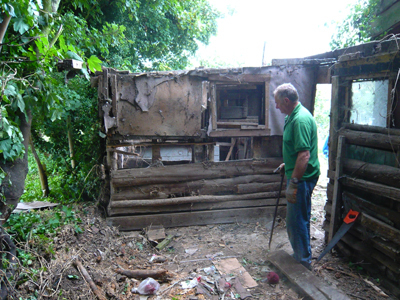 Alan and Peter are so efficient that day one saw the sheds emptied, contents stored under a tarp, burnt, or put on one side for skip or dump, and the roofs off. day two was yesterday, and the demolition is complete. I have a huge stack of old wood to cut up for fuel. on the down side the horrible bonfire is still smouldering. Alan is one of those bonfire addicts; he merrily stuck everything on it – roofing felt, carpet, plastic roofing, mouldy and moth-eaten yarn, and many other unspeakable objects which had been hidden away in the darkest recesses. two trees may be a bit the worse for wear – the rowan and the olive tree, which has only just been planted out in the wild garden after a sheltered life in a pot, have scorched leaves nearest the fire. 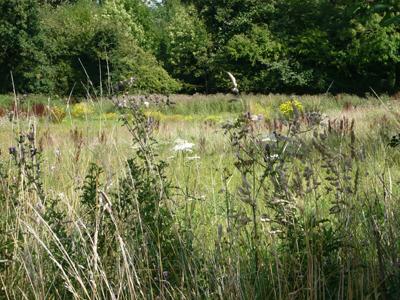 and there is another of those terrible craters which I so often end up with, difficult to get anything to seed in it. today one skip goes and another replaces it, bringing a load of ballast for the post holes and to add to the concrete floors, to produce a damp-proof level base for the rough plank floor. 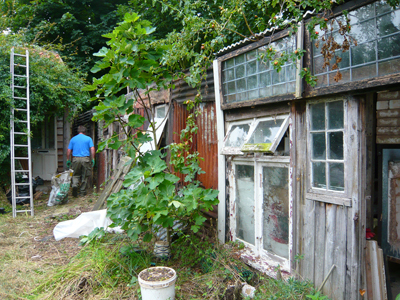 but until the two sycamores which were impinging on the old shed are cut down, not a lot of reconstruction can begin, and the guy who is doing that can only manage Monday. meanwhile I am having a new duct made in stainless steel to take the heat from the kiln chimney out sideways through the gable end of the shed, which will be wrapped in ceramic fibre to insulate the roof. no more climbing on the shed roof to open up the top and drop in the chimney. my shed bedroom is a lot less cosy now it’s no longer screened by the montana and the ceanothus which had grown so enormous and now are stumps, cut away so that the sheds can be worked on. Sal had a disaster almost two weeks ago; we were walking at Morston, near the freshes, when a dog initiated a fight with him and then got hold of his neck and wouldn’t let go. Sal screamed in fear and pain, and the dog’s jaws were unclamped by one of the lads in charge of the dog. which looked to me like a cross between a staffordshire bull terrier and a whippet or greyhound. when I got home I discovered that more damage had been done than I had realised at the time, one big deep hole next to his shoulder, and a smaller one under his ear. 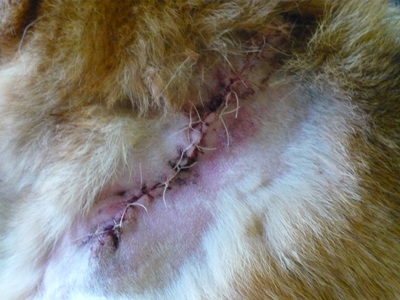 so far the vet’s bill is �400 and Sal has a huge stitched wound after they cut out dead tissue on Tuesday. in terms of pain and stress and worry (not forgetting he is nearly twelve), this is bad enough, but the bill adds insult to injury. this August there have been a lot of dog biting dog incidents, and a spaniel died at the vet’s on tuesday morning after being savaged by a greyhound on the beach the day before. I won’t be walking on the coast again with Sal until the holiday makers have gone home. a very nasty picture follows – sorry about this, but it brings it home. Sal’s shoulder looks like the Sunday joint before its cooked. 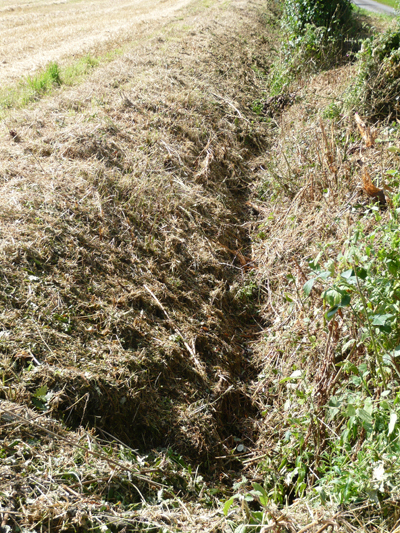 it’s a shock to see banks and ditches which were high with flowers, grass, bramble and bracken reduced to this dry, dead, shaved bristle. 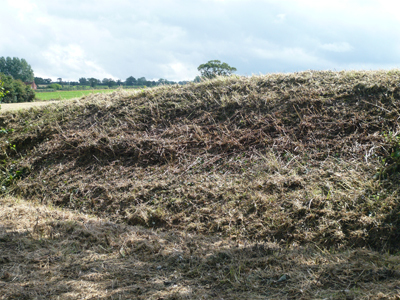 in several places around Bale and Hindringham farmers have started tidying up, although they haven’t been able to finish harvest yet because of the rain. the corn marigold, hard heads and scabious I photographed a week or two ago along the roadside are all gone, and the smaller trees given a flail too. bits of branch lie in the verge. but there is a small damp field full of wild flowers, the Hindringham side of “Botany Bay”, alongside the narrow neck of woodland which extends out to the road from Bale Wood, where I saw a roe deer last week. it looks scruffy because there are docks and thistles and a bit of ragwort in there, but the flea-bane rules, along with rosebay willow herb. I hope it doesn’t get cut too soon. 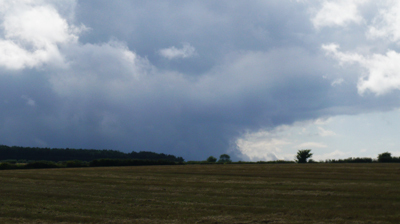 walking today there was the ominous presence of this storm to the South, but it veered off, and we basked in some welcome sunshine until the next system, three hours later; that missed us too though. 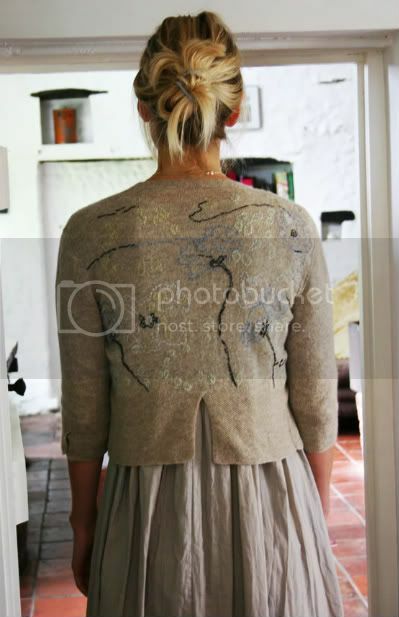 yesterday was spent photographing the knit collection, editing and getting the photos on line. they are here. we were in and out with the weather, but my neighbours’ house makes a fantastic backdrop, so a huge thanks to them, and to Sid for being the face of Jane Wheeler once again. I’m pleased with the results anyway, and it is very nice to see the knits which were just ideas a few weeks ago, on a person and working, I think. I enjoyed using the cucumber plant as a prop, but we had fun with the doorways; it gave Sid a frame to interact with. it may have got a little obvious and repetitive, but it helped. yesterday was a butterfly day. 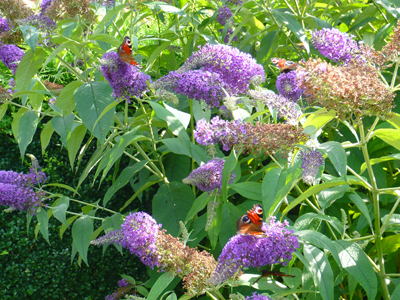 the buddhlias in my garden had about forty big peacocks, a couple of commas and one red admiral. 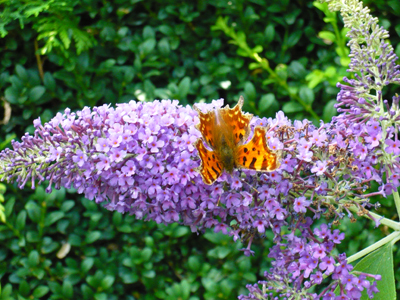 it’s worth having buddhlias just for the butterfly show, even though they have to be cut right back every spring and disposing of the prunings is a nuisance. 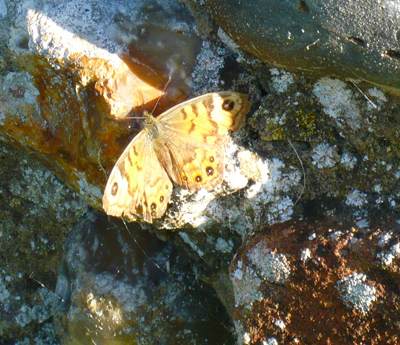 our early morning walk in strong sunshine revealed a wall brown, basking on a wall, true to its name. I haven’t identified one of these before. 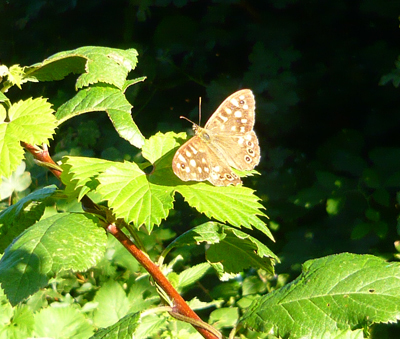 in Cake’s Lane there were plenty of speckled woods flitting around. an eighteenth century name for this butterfly was wood argus, after the character in greek mythology with many eyes. 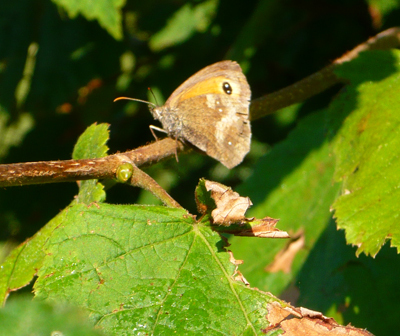 I managed to catch a female meadow brown resting in the sunshine too; maybe a sunny early morning is a better time to photograph butterflies as they sunbathe before starting the serious business of the day. I cleared the table in the workshop, put all the anagama pots on one side and started making again. there is a lot of grey stoneware clay to use up which I bought and mixed before I got started on the iron-rich darker stuff, so it takes a little thought about glazing and firing. however, I have hardly any really big pots that I like at the moment, so that’s the next project. on Thursday I made two rectangular platters in this clay, the sides bent up by supporting them with rolls of bubble wrap, with porcelain inlay and scraped on. of course the difference between this clay body and the porcelain, especially under a glaze, is very subtle. 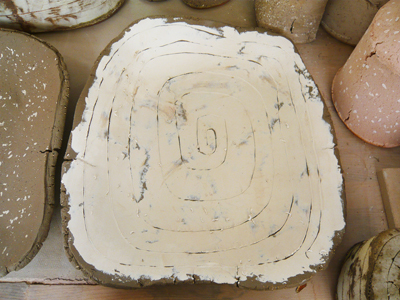 it looks like quite a lot when the clay is wet like this, but fired its more the quality of the surface, and under a glaze that’s not so visible, nor is the blue-white of porcelain against grey to buff to toasty clay body depending on the atmosphere in the kiln. still, subtle is always good. 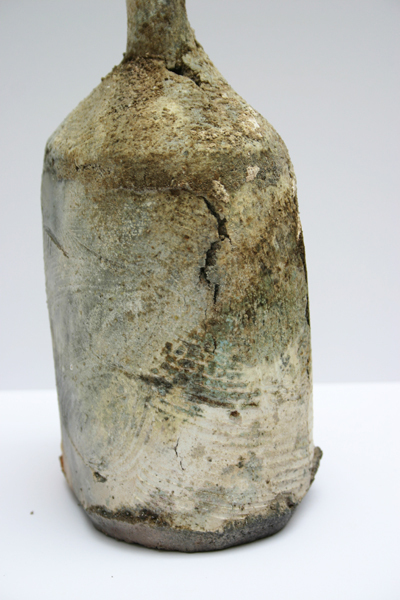 and if I use the barium glaze, with a lot of copper glaze in the firing, over porcelain it turns a pale turquoise green. its hard to see the shape in a photo, but basically they are flat bottomed with the sides turned up. with these rectangular shapes the biggest problem is getting them to dry and fire with the flat bottom staying even. 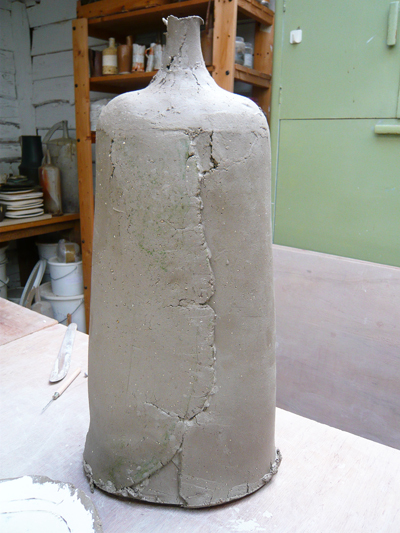 my first big bottle of this series – just plain, and seriously near collapse during the first stage of making. 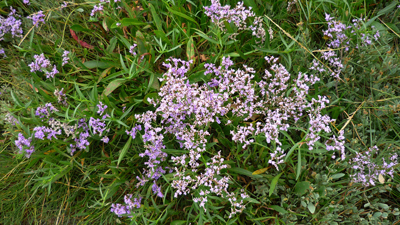 sea lavender patches the marsh with purple at this time of year, contrasting with the predominant bright green of the samphire standing up across the mudflats. 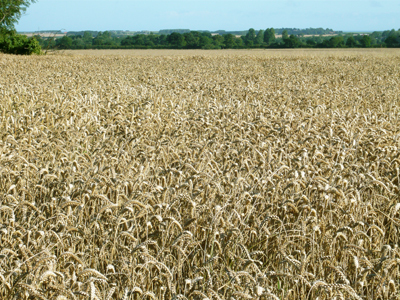 inland most of the barley has been harvested and the fields tilled, making them sadly drab and autumnal. cold wet weather is holding things up as usual, and there are still a few fields standing, and of course all the wheat, which is not quite ready yet, though the heads are turning down, and if the wet continues I doubt it will be a good harvest. we walked almost to Hindringham and then back early this morning, in the sun, with a blue sky and a strong wind. from parts of the road there are great views of the coast at Holkham and Blakeney. blackberries are forming on the hedgerow bramble bushes; it’s a wonderful place for picking them in mid to late September. 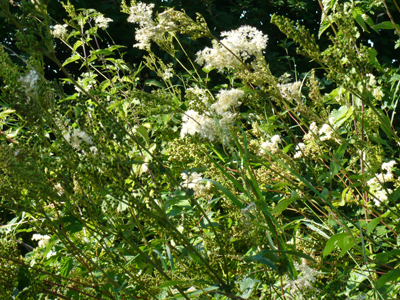 the hedgerow is particularly rich, especially in the little valley where a tiny stream, which flows through Bale wood and eventually joins the Stiffkey, crosses the road through a culvert. there is always a flow of water on the surface of the road there, from some spring welling up. 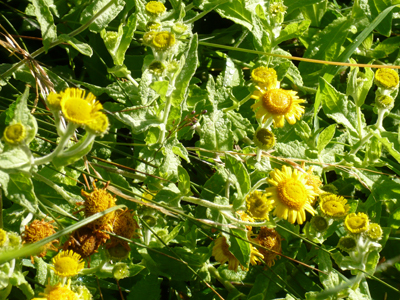 a big clump of flea-bane, which I had confused with corn marigold, grows in the damp hedge next to the corner of the stubble field, several stands of meadow sweet and great willow herb line the banks, and alder is a predominant tree. 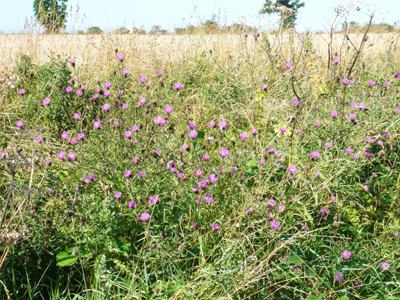 and common knapweed or hard head is everywhere along the road. I saw a hare in one of the fields; Tilda smelt it, but what really got her going was a field vole in the middle of the road. she and Sal completely missed its trail through the bank in their excitement. I am in the middle of Roger Deakin’s Waterlog now; an intense evocation of water, immersion in it, and its varying qualities. it’s a chilly read, as he skinny dips in river pools and wanders the banks of rivers and lakes, and beaches of Britain in his swimming trunks. I think I prefer the comfort of my sofa to experiencing the real thing, unless the weather improves. the garden is at its zenith, and the wind and rain means I have been spending some time tying dahlias, sunflowers, tomato and bean plants up with green string. 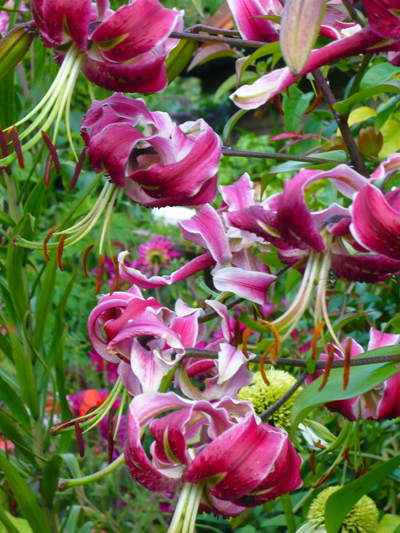 the lilies are at their most intense. but of course it’s not good weather for sitting outside and enjoying them. 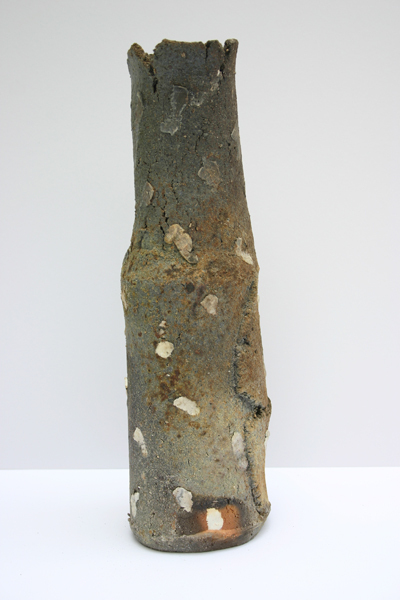 after many interruptions I have at last polished up the photos of my pots from the anagama firing and put them up on a web page, here. 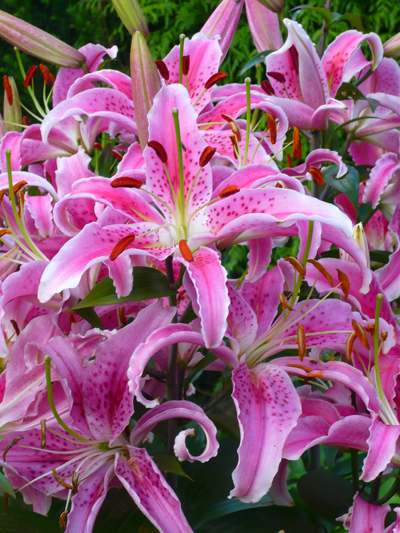 I also experimented with some flowers. these naked baked earth pots seem to work better with flowers than glazed pots. 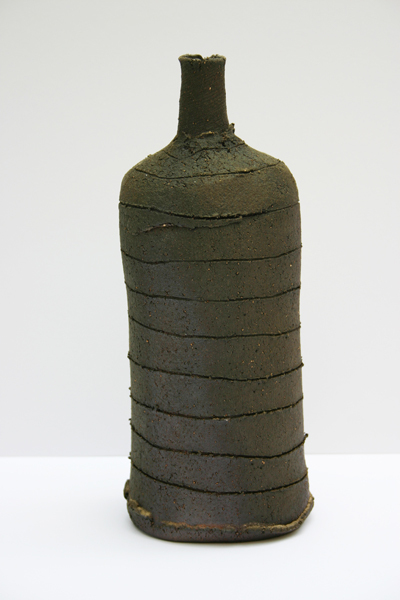 it’s problematic getting water to stay in them; even those with no cracks which ought to be well vitrified, like the scored red clay bottle below, allow water to seep out. a plastic bag works best, filled after insertion. this is the terracotta crank, pure and simple, fired at the back of the kiln, which would have been cooler. I must ask Valentines what the grog in the crank is made of. 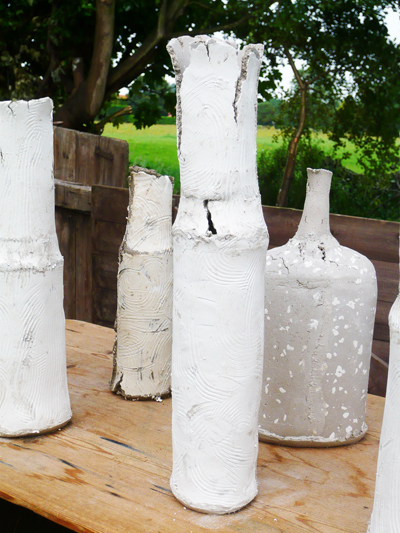 if it is fireclay, it must increase the possible firing temperature quite a bit. you can’t see the true colour clearly in the photograph, in fact it varies between a greenish cast and a purple one which has a sheen to it. I will definitely get some more of this clay, both to use on its own, and to mix with stoneware clays, probably one of the buff cranks, to get a better iron-rich dark clay body. I won’t get these wonderful dark colours in my kiln though. at the back of the kiln, away from the bulk of the ash and heat, the pots are quite bare, but really cooked. the porcelain has taken on the colour of old ivory, and the iron-bearing clay has turned dark purple, or very dark khaki, with that slight shine, and some more protected parts have stayed rust coloured. nearer the front of the kiln there is more ash deposit, which has stayed solid and dry, mostly. but this pot has shine and rough ash/ember, and some good colour as well. the other side of it is well covered a in a dry haze of ash, but there is still that purple colour. 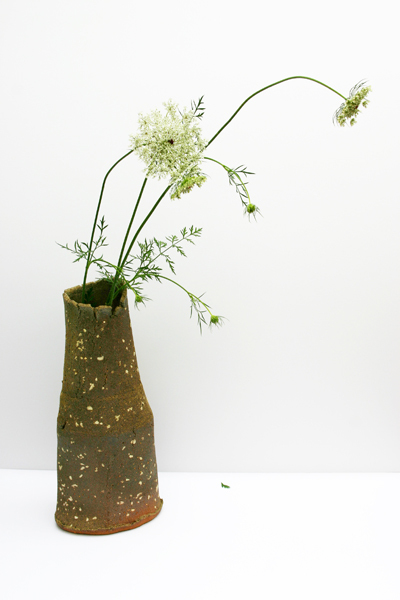 Shozo and Gas picked this tall narrow pot as something really special; they liked the clouded effect of the porcelain overlay, and it has picked up the colours of ash, flame and reduction in a subtle way. because porcelain fires translucent, the uneven thickness of the overlay makes it cloudy. another random painterly thing that clay can do. this bottle was one of those right next to the firemouth. I suspect the temperature was lower there, under all the ember, but this pot has wonderful scorch marks on it. 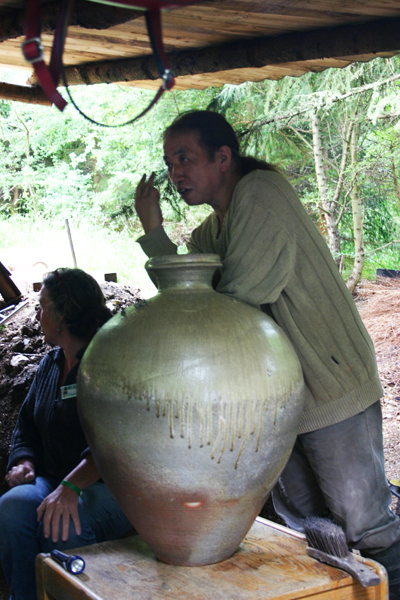 all in all, I think Gas’s medieval Japanese kiln firing does suit my pots, unlike the usual western anagama firing which involves a lot more ash on the pots, so that they really are glazed, or even the pots being glazed before they go into the firing. frustratingly I won’t get a chance to fire my work like this again for some time. ten days is a big chunk of time, and then there is the recovery time, as well! my knees are not getting any younger. and of course I am dependent on someone else’s firing expertise and willingness to allow me to participate in the firing and take up space in the kiln. 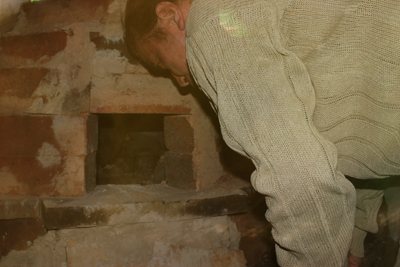 I am very grateful to Gas for the chance to do this, and to all the other co-stokers who helped fire the kiln. we unpacked the kiln yesterday afternoon. it rained while we were doing it, so there wasn’t so much light and I had the wrong camera with me for low light conditions. Linda and Erwin came, Vivienne Rodwell-Davies, who made pages and pages of beautiful ink and wash drawings of the event at the weekend, Vicki and her parents, Ko and his Japanese potter friend, Shozo Michikawa, and a few others whose names I am really sorry but I don’t remember. 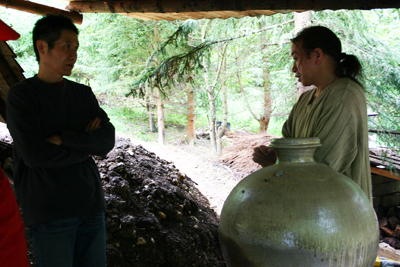 it was a very Japanese event, as Gas, Ko, and Shozo clustered around the kiln mouth, taking out the pots and discussing them animatedly, handing them to us ignorant mortals to clean up and pass around. it was very exciting. the first ones were those which had been immersed in ash and ember, so they were still covered in ash. Linda scrubbed them in water, but I kept two of mine back, as I wanted to photograph them in that state before they were cleaned. we put most of them on the blue staging which we used to work out the pack, trying to keep to where they were in the kiln. but then they overflowed onto various perches around the place. 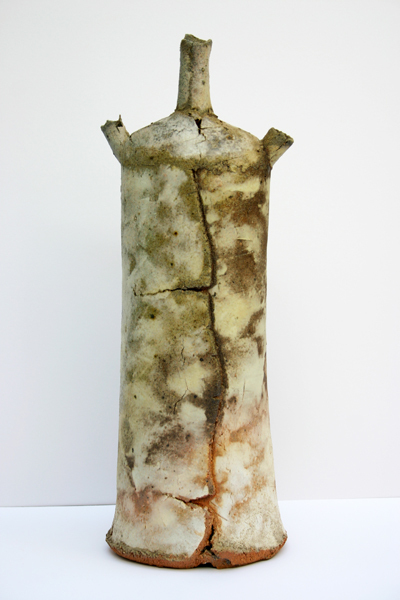 Svend’s big pot appeared to be fine, but turned out to have three or four major cracks in the lower part. 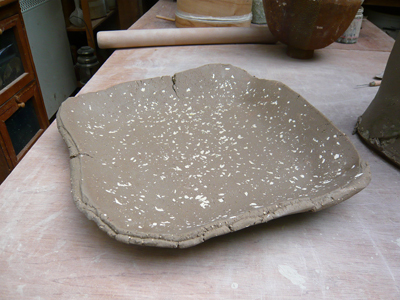 it was nearly as dramatic to remove it as to put it in the kiln. it looks very beautiful anyway. this is Shozo talking to Gas. he is very intense. I would have liked to talk to him more, his work is very interesting, and he has done a residency in Northumberland and had a one man show at the Galerie Besson, apart from numerous exhibitions and workshops internationally. I hope to put a link to his website here. 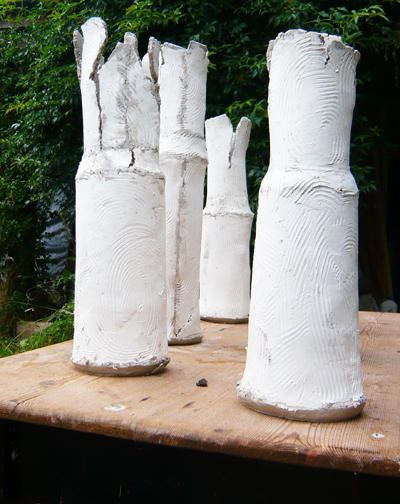 here are a couple of my pots, photographed au naturel. I was very happy with the result. there is a little shine from the ash, but not much, and it just livens the pots up a little. otherwise they are too dry, I was informed by my Japanese friends. 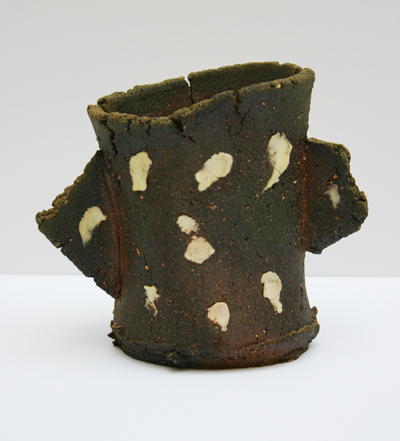 the porcelain applied to the pots works really well like this, as there is no glaze covering it. 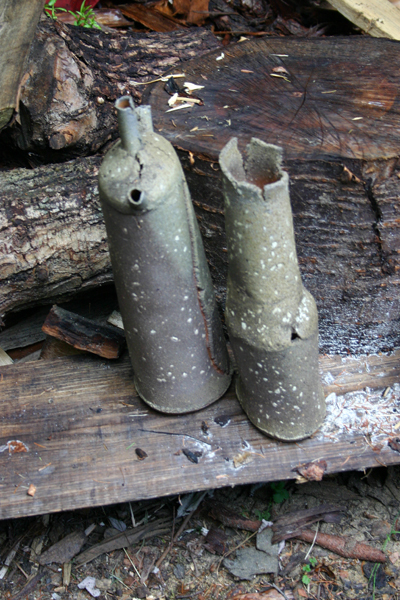 the clays I use fire well in an anagama, as they have some iron in them and the more iron, the more colour. 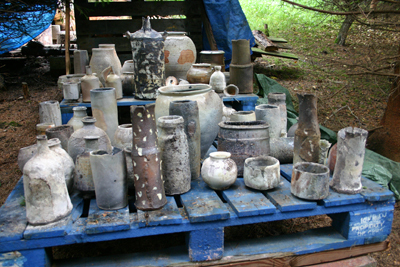 anyway, I shall discuss this when I have been able to photograph the pots and make a web page. Gas’s pot which was in front of Svend’s is very beautiful. I hope to get hold of a photo of that too. Vicki had some good results. 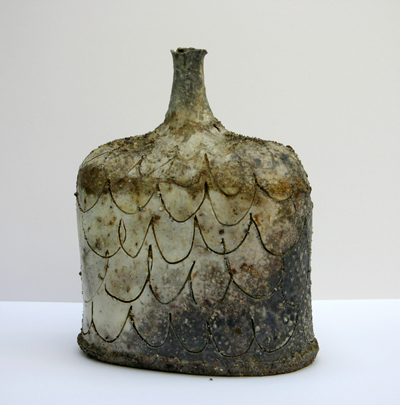 John Butler had two bottles I saw which looked very special, and Lisa Hammond some great tall vases/jars. I don’t think it was so successful for her teabowls. before we opened the kiln we went to Hatfield Art in Clay ceramic fair. it is huge and most of the work was not to my taste. it was nice to see some old friends, like Nic Collins, and new friends, Linda and Erwin. there are five or six big marquees of fifty potters each, and some solo tents in the middle. 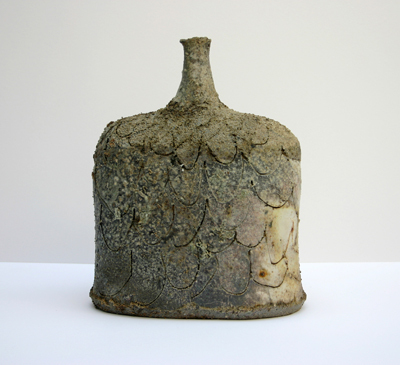 I found Akiko Hirai again – I bought two of her plates at Rufford two years ago, and I bought two more this time. I find her work very feminine and charming. and I bought a small bowl from Svend, quite a deep enclosing shape, in temoku ( a thick flowing black glaze with brown edges), with three little shell scars in the bottom. I also found a very good book on African ceramics, For Hearth and Altar: African Ceramics from the Keith Achepohl Collection by Kathleen Bickford Berzock. there are some wonderful pieces in it, which I hope to be inspired by. a long day with a lot of driving, I left for home at seven forty-five, the car full of boxes of pots, just as Lisa Hammond arrived with Lukas, her student assistant and Nic Collins; I got home at ten twenty.